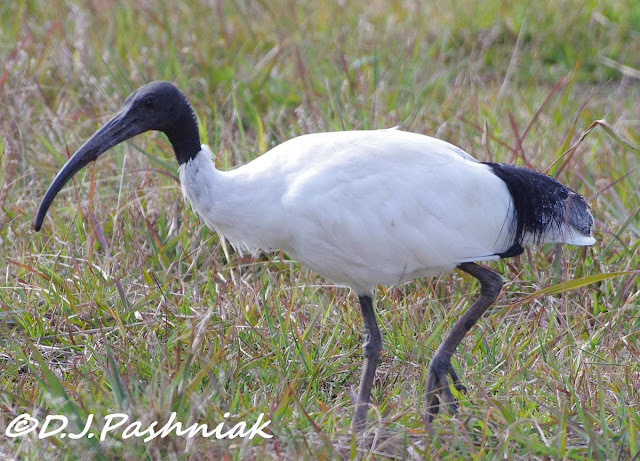 The other week I posted some photos of Australian White Ibis (Threskiornis molucca) and was quite surprised at the interest shown by overseas readers of the blog. I think we often forget that what is common and unremarkable in the local environment is not so in other places. White Ibis have become common in cities and towns on the east coast of Australia. These birds have the unfortunate ability to adapt to feeding on whatever humans drop or put into rubbish bins or land fills. When city parks become home to hundreds of these large birds (65-75 cms or 25-30 inches) then local councils are pressured to do something to control them. Some cities have simply culled them. A few years back Brisbane council hired a man with a trained Wedge-tailed Eagle to fly over the parks where the Ibis were the most numerous. It worked! However, at the same time as the birds are a problem in urban areas, they are becoming scarce in inland wetland areas. So a debate has been raging as to whether they are a pest or an endangered species. 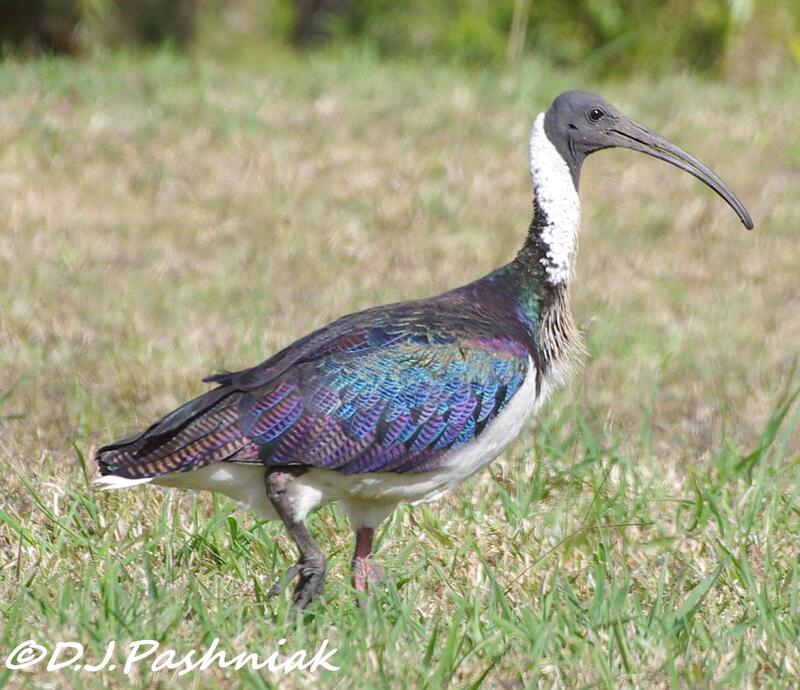 The Straw-necked Ibis (Threskiornis spinicollis) is about the same size as the White Ibis but it has not adapted to eating human left-overs! It is found around fresh water swamps and in grassland. It eats small aquatic creatures and also grasshoppers and crickets etc. Because of its liking for grasshoppers etc it has been called the "farmers' friend". Ibises also use their long bills to probe into the ground for food. Yesterday, I saw these Straw-necked Ibis busily moving across some vacant land and picking up whatever insects moved. I frequently see both kinds of Ibis around town. WOW! that 2nd one with its iridescent feathers is amazing! haven't seen that one before in blogland! Gosh, Mick, you've really caught the beauty in the feathers of the straw-necked ibis. And that white ibis is the cleanest one I've ever seen! Now I didn't know anyone was concerned about declining White ibis numbers in their region! I must admit to thinking of Straw-necked in the same way as White ibis - I forget their patterns of behaviour are quite different. Well done on capturing those shiny feathers! Well, I'm thoroughly jealous that you have seen and photographed this handsome bird. Sorry to hear they have become pests, or what many people think are bests. Wonderful close ups!! Boom & Gary of the Vermilon River, Canada. Lovely photos! Such beautiful feathers the straw-necked ibis have! That straw necked ibis....glorious colors! Incredible images this week. Great series love the Straw-necked Ibis. Your Ibis are cool! The straw necked Ibis is my favorite. Great shots! Oh fabulous shots! Gorgeous colouration on these birds.! I love the iridescent colors on the Straw-necked Ibis. Thanks for visiting me. 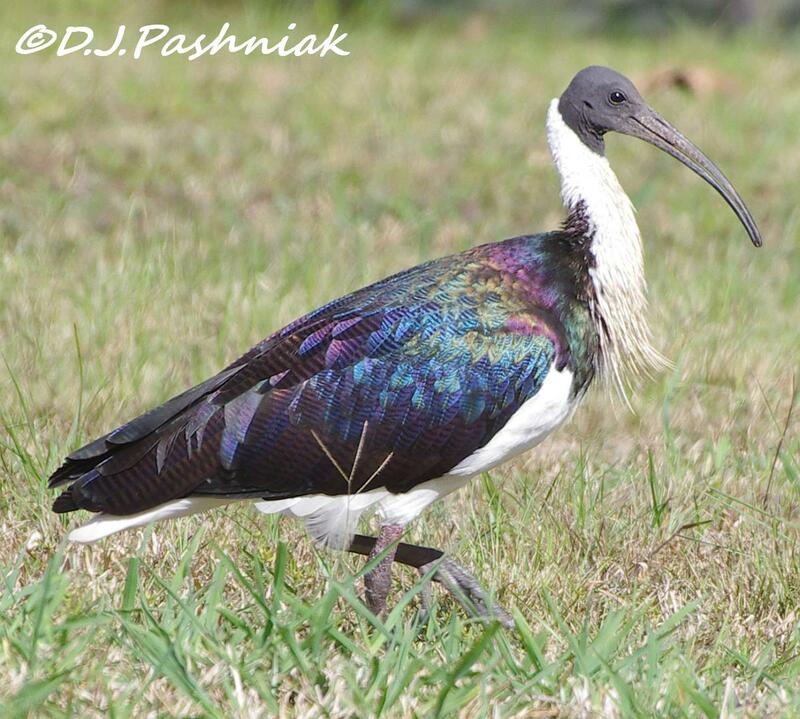 Superb shots of the Straw-necked Ibis Mick (love the name). It's a shame that the White Ibis have become a "pest" simply by wanting to clear up our human rubbish. We have a similar problem here with gulls but they are simply adapting to their environment and finding new food resources. great to show the two together like you did here Mick; I love the straw-necks up close and all the iridescent colours showing; good pics! Interesting bird. The colours are very pretty. An interesting post with those super 'Ibis' shots. Love the Straw-necked Ibis. Can´t remember seeing it before. It has a very happy expression in its head. :) Thanks for sharing. Last week I observed a flock of Straw-necks feeding on the fairway of a golf course, presumably sorting out some grass eating insects or their grubs. It made me think of how another nearby course had destroyed a White ibis nest site because the birds were smelly. I wonder how the insecticide use at the two facilities compares? These birds seem very exotic to me. Those iridescent feathers are beautiful. Good point, Mick. That's why it's so interesting to participate in memes such as Wild Bird Wed. We get to see birds that we may never see in our lifetime. For me, I wish I'd been interested in birds when I visited New Zealand a few years ago. I saw such a fantastic variety, but I didn't photograph--too busy looking at gardens. These birds have very "business-like" beaks and their markings and colorings are wonderful, each in its own way. I love the rainbow gleaming feathers of the straw necked ibis. Great shots to capture that. Great photo of this beautiful bird. The colors are really great. This can only see in the zoo in the Netherlands. Interesting discussion. The Sacred Ibis has probably been exterminated from Florida as it is considered an invasive exotic. Our White Ibis looks quite different, and it is doing very well! Oooh, they have luminous feathers like a hummingbird. The straw-necked one is beautiful with its shiny feathers (I know the incande...word, but not how to spell it ;>)) Very interesting about how it is a pest in some areas and yet endangered in other areas (which are probably the ones where it really belongs)... I still think they look more like the Florida wood stork than our ibis. All I can say, is how gorgeous these are! I agree entirely with your opening statement, but it dosn't stop us looking at your pics with envy. I also agree. If these birds were rare we would go miles to see them. I got some images this summer of these birds on the outfield of a cricket pitch! Great post, Mick! I think our local White Ibis is in a similar state, seems to adapt well to human habitation and doesn't hesitate to forage on whatever is available. They're becoming more and more common in parking lots. The Glossy Ibis, on the other hand, still prefers a more natural setting. What interesting-looking birds! I guess each continent has its own common sights and we seem to take them for granted. Spectacular subtle colours in the feathers. Always interesting to see creatures from different parts of the world.